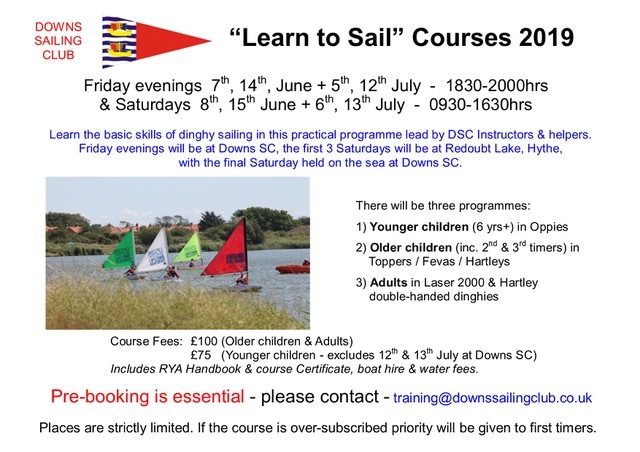 In order to take part in training you need to be member of Downs Sailing Club. Downs Sailing Club became an approved RYA Training Centre in 2007. This approval allows us to run RYA courses and issue RYA qualifications. To maintain our status we have an annual inspection visit by RYA HQ Staff. At Downs we offer a number of specialist courses for members, which are run by RYA qualified instructors on a voluntary basis. We are not a commercial training establishment and only provide courses for our members and occasionally members of our associated organisations. This course leads to an internationally recognised qualification giving the holder authority to use marine VHF radio equipment. The course follows the RYA / MCA syllabus and involves theoretical and practical sessions. There is a fee of £90 to cover expenses and the cost of the independent Assessor. Places are limited to eight people, and you have to be aged 16 or over. This session explains how to use the Club’s fully automated sailing race timer and management system. This session is recommended for all members who intend doing a Race Officer duty. The course will follow the RYA Powerboat Level 2 Syllabus helping to develop skills and understanding with sessions ashore but principally time afloat. Topics include safety boat preparation, launch and recovery, boat handling, anchoring, towing, simple passage planning and emergency procedures. The course is recommended for all members doing DSC Safety boat duties, and will be coupled to a mentoring scheme to consolidate and practice the skills further as part of the DSC Duty roster. A second Powerboat 2 Course will be arranged later in the season if there is enough interest and demand. 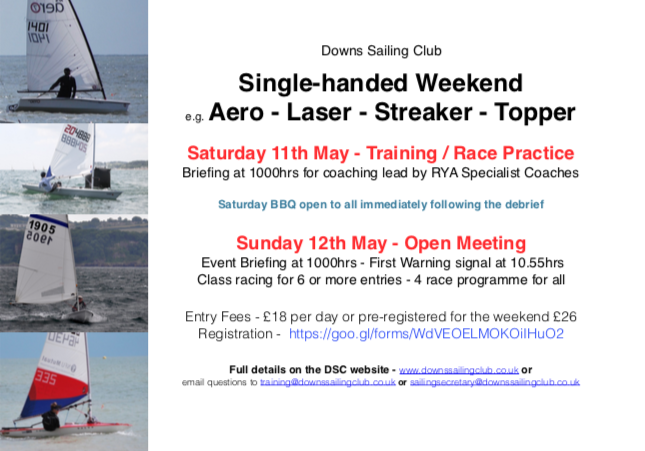 This Race Training day will be lead by experienced national level racers – be open to toe-strap single-handed dinghies. Depending upon conditions and sailors requests; the programme could include better boat handling, sailing in waves, starting, mark rounding in a tideway and preparations for the Open Meeting on Sunday. For adults – This introductory programme will follow the RYA Start Sailing level 1 and Basic Skills level 2 syllabi. A variety of boats will be used but mainly the double-handed Laser 2000 dinghy. Friday evenings starting at 18:30 will be at Downs Sailing Club and will include sailing theory and preparation for the following day. The first three Saturday sessions starting 09:30 will take place on the sheltered waters of Redoubt Lake, Hythe. The final Saturday starting at 09:30 will introduce everybody to the equipment and sailing on the sea at Downs SC. The Mentoring Scheme will work in association with the routine Club Safety Cover Duty Rota. 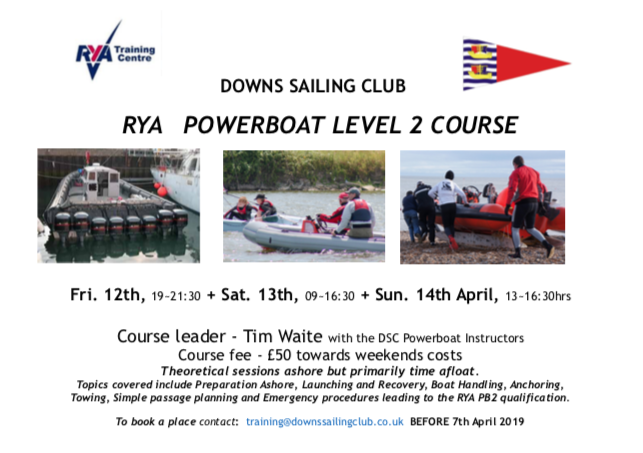 The Scheme is open to people who have recently done a PB2 Course and those who feel they are short on experience and/or confidence to manage a DSC duty as a Safety Boat driver. A Mentor per week will be arranged at one of the DSC duty sessions (this session would be one of the Mentors official duties for the season). The Mentor will be in a supporting role, not in a leading role, in that way the member would gain the maximum benefit by working with an experienced, knowledgeable and interested person. The Training Committee in conjunction with the Rota Manager and Chief Powerboat Instructor will manage the scheme.